We’d love your help. Let us know what’s wrong with this preview of Shortchanged by Mariko Chang. Women now receive more college degrees than men, and enter the workforce with better job opportunities than ever before. Indeed, the wage gap between men and women has never been smaller. So why does the typical woman have only 36 cents for every dollar of wealth owned by the typical man? How is it that never-married women working full-time have only 16% as much wealth as Women now receive more college degrees than men, and enter the workforce with better job opportunities than ever before. Indeed, the wage gap between men and women has never been smaller. So why does the typical woman have only 36 cents for every dollar of wealth owned by the typical man? How is it that never-married women working full-time have only 16% as much wealth as similarly situated men? And why do single mothers have only 8% of the wealth of single fathers? 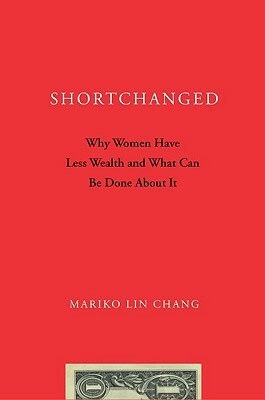 The first book to focus on the differences in wealth between women and men, Shortchanged is a compelling and accessible examination of why women struggle to accumulate assets, who has what, and why it matters. Mariko Lin Chang draws on the most comprehensive national data on wealth and on in-depth interviews to show how differences in earnings, in saving and investing, and, most important, the demands of care-giving all contribute to the gender-wealth gap. She argues that the current focus on equal pay and family-friendly workplace policies, although important, will not ultimately change or eliminate wealth inequalities. What Chang calls the -wealth escalator---comprised of fringe benefits, the tax code, and government benefits--and the -debt anchor- must be the targets of policies aimed at strengthening women's financial resources. Chang proposes a number of practical suggestions to address the unequal burdens and consequences of care-giving, so that women who work just as hard as men will not be left standing in financial quicksand. To ask other readers questions about Shortchanged, please sign up. I dog-eared so many pages in this book! The one that particularly stuck out to me is the inclusion of a quote by Virginia Woolf saying how she would take money over the right to vote as a women because money has more power. Well, she's not wrong in that thought, which is why discussing gender pay and wealth inequality is so important. We know that women have to work almost 1.5 years to make what their male counterparts make in 1 year. That adds up to millions of dollars over an entire career. Wom I dog-eared so many pages in this book! The one that particularly stuck out to me is the inclusion of a quote by Virginia Woolf saying how she would take money over the right to vote as a women because money has more power. Well, she's not wrong in that thought, which is why discussing gender pay and wealth inequality is so important. We know that women have to work almost 1.5 years to make what their male counterparts make in 1 year. That adds up to millions of dollars over an entire career. Women are being shortchanged not only in income, but also in the wealth they own. The author points out that wealth is more important as you can have a good income but little wealth. She reports that women own about 36 cents for every dollar of wealth owned by a man. Various factors of course go into having the cards stacked against us. This includes women taking on the burden of child and family caregiving more which reduces their full-time employment and the benefits that come with that (health insurance, retirement plans, flexible spending accounts, social security, etc.). We can be less likely to invest aggressively, are not helped by the tax code as much men, have less wealth building businesses, and also spend more of our money on children, healthcare (given the higher premiums), and social services/charities than men. Even though married women have the most wealth (although they are more likely to get lower pay if a mother), they tend to have less financial independence, and then when the marriage ends, they are in the same spot as the rest of us. The author points out that most people spend more adult years unmarried than married nowadays, 50% of women will become divorced, and many women die after their husband. We are all single at some point so no one is immune to gender inequality. After discussing the problems, the book focuses on recommendations for improving wealth inequality. This is an important aspect for society and its not only good for women but men. If we close the inequality gap (which is even worse for non white women), women will have a more secure and stable economic life, be able to invest more money in their children (which they do more of than men), and children could have more time with both parents. Insightful book about the gendered disparity in wealth and more importantly, how the wealth escalator is instrumental in acquiring wealth faster.